Michael Isaacson. Photo by Matt Fitt. The UC Regents have approved the appointment of Michael Isaacson as acting dean of the Baskin School of Engineering at UC Santa Cruz. Isaacson, the Narinder Kapany Professor of Electrical Engineering, takes the place of former dean Steve Kang, now chancellor of UC Merced. "Michael Isaacson is an accomplished researcher with a proven record of providing excellent leadership within the Baskin School of Engineering, and I am delighted that he has agreed to serve as acting dean," said Acting Chancellor George Blumenthal. Isaacson previously served as acting dean for six months in 2006 while Kang was on sabbatical leave. He has also served as associate dean of research and graduate studies in the engineering school, chair of the Department of Electrical Engineering, and science director of the University Affiliated Research Center at NASA Ames. Isaacson received his B.S. degree in engineering physics with highest honors from the University of Illinois at Urbana-Champaign and his M.S. and Ph.D. in physics from the University of Chicago. 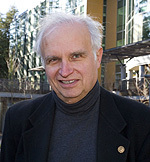 He has been on the scientific staff of the Biology Division at Brookhaven National Laboratory, a faculty member of the Physics Department and the Enrico Fermi Institute at the University of Chicago, and a professor in the School of Applied and Engineering Physics at Cornell University before moving to UCSC in 2003. Isaacson's research interests include development of novel nanocharacterization tools using electron, photon, and ion optics and the fabrication of nano/microdevices for biomedical applications. He has published over 150 peer-reviewed articles and book chapters and is currently working on a text for Cambridge University Press entitled "Nanocharacterization of Materials." A fellow of the American Association for the Advancement of Science, he has been president of the Microscopy Society of America and serves on the Executive Board of the Engineering Research Council of the American Society for Engineering Education. Among the many awards Isaacson has received are a Sloan Foundation Faculty Fellowship, an Alexander von Humboldt Senior Scientist Award, the Burton Medal from the Microscopy Society of America, and the Rank Prize in Optoelectronics. A high-resolution photo of Isaacson is available here.